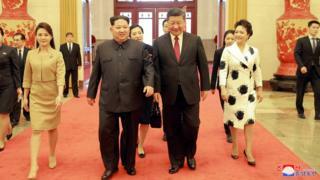 North Korean leader Kim Jong-un's surprise visit to China's President Xi Jinping has left many wondering how it will influence the next move on the global chess board of power. But as ever, Pyongyang's next move is difficult to predict. Kim Jong-un is making things right with China at a crucial moment. For months, Pyongyang has been giving Beijing the cold shoulder after President Xi agreed to impose international sanctions. The Kim regime even turned a Chinese envoy away when they tried to visit Pyongyang last year. But China remains North Korea's biggest trading partner and only long standing ally. If you're heading into the global arena you want someone in your corner. The young leader had invited South Korea's President Moon Jae-in and President Donald Trump to meetings. President Xi may have been feeling left out. Making Beijing his first trip outside of North Korea, bringing his wife and a high level entourage will help make up for that. Mr Kim is also showing some shrewd judgement. He made his visit just after President Trump appointed two hawks in Mike Pompeo and John Bolton. He may worry that talks with President Trump will come in the form of the ultimatum - give up your nukes or else. His meeting with President Xi tells the US that he is not on his own, he has a powerful ally. China could also help de-escalate the situation if the talks go badly. By some estimates China accounts for almost 90% of North Korea's total trade with the outside world. China is North Korea's largest provider of food, fuel and industrial machinery. And up until very recently, whenever the US and the global community ratcheted up the pressure of sanctions, it has been Beijing coming to Pyongyang's rescue. But things have changed in the last few months. China said it cut off coal imports from North Korea last year. Coal is North Korea's biggest export: that ban led to a significant reduction in North Korea's exports, analysts say, which is putting pressure on the Kim regime - in particular the elites he needs to keep happy and to maintain legitimacy for his rule. So has the economic pressure from China led to a more pliant North Korea? It's important to note that many Beijing businessmen, according to the United Nations, still skirt sanctions and do business with North Korea. There's also no way of telling what the ultimate game plan is for any of these leaders. On the one hand, Beijing doesn't want to see a failed North Korean state over the border - it would mean millions of refugees pouring into China. But there is also speculation that amongst some of China's elite there is growing discontent with the relationship with Pyongyang. And that amongst some of China's new globally minded classes - the ones that attend international conferences and want to call the shots in the region - the "North Korean problem" - is standing in the way of Beijing's vision for itself as a global superpower. Being the power-broker for a Trump-Kim meeting could fit into that vision - and also solve Beijing's problem of a naughty North Korea. The comments China's media attributed to both leaders are pretty illuminating if true. Mr Kim reportedly told Mr Xi that because "the situation is developing rapidly" he felt he should come to Beijing in person "out of comradeship and moral responsibility". Given how tense relations have been recently it's significant that Mr Kim made Beijing his first foreign trip, before his planned meetings with South Korea's President Moon and Mr Trump. Crucially, Mr Xi reportedly said China "sticks to the goal of denuclearisation of the peninsula" and Mr Kim responded: "It is our consistent stand to be committed to denuclearisation." Image caption Back to being buddies again? This may sound bizarre, but there is a logic there. They would argue that if they felt sufficiently secure there would be no need for such weapons. The fact that Mr Kim is on the record saying this in Beijing in front of Mr Xi may show that the North Koreans are paving the way for a face-saving nuclear disarmament. Mr Trump is planning for a win: successful negotiations with Kim Jong-un over his nuclear programme. Behind the scenes, Chief of Staff John Kelly and others are trying to exude confidence about what they'll be able to achieve at the summit. In a candid conversation with me and other visitors in his office recently, Mr Kelly described their high expectations for the meeting. Meanwhile the CIA director is visiting the Pentagon, discussing the matter, and Defence Secretary Jim Mattis is coming up with contingency plans. Details for the summit are still being worked out. 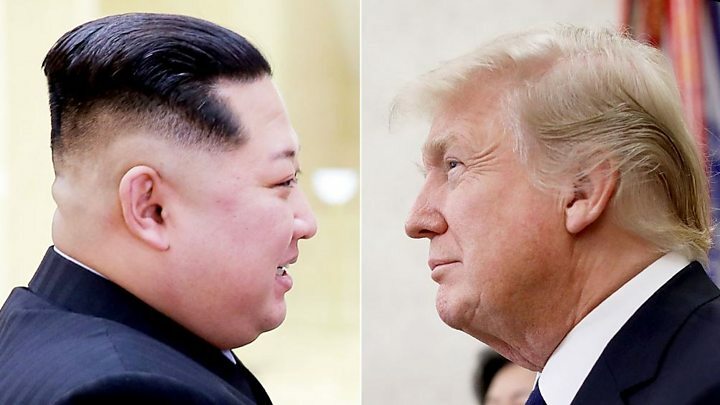 The president likes to keep people guessing about how he'll negotiate and where his red lines are, and his meeting with Kim Jong-un is no exception. Mr Kelly and the other aides have several weeks - or perhaps a bit longer if it is delayed - to finalise things. As they are keenly aware, the countdown has begun.